Haad Yao East and Than Phraphad are small beaches on the East Coast of Koh Phangan that are usually off the radar for visitors to Koh Phangan. One has been sold to a luxury hotel developer and the other is up for sale. Quietly, this part of the island is attracting interest from those wanting to build high-end resorts. Haad Yao East is largely unheard of because there is another beach on the island called Haad Yao. 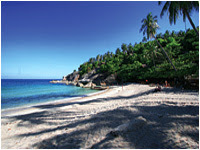 It is located on the west coast and is a popular holiday destination as it has a 1km long beach and a nearby coral reef. This beach is sometimes called ‘Haad Yao West’. 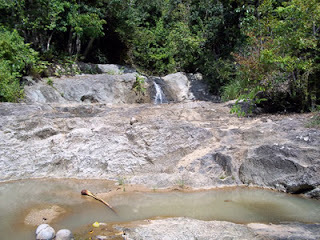 Than Phraphad is a waterfall and jungle area near Haad Nam Tok. It is a famous beauty spot for Thais but has been largely over-looked by foreign visitors to the island due to its inaccessibility. Moreover the neighbouring waterfall of Than Sadet with its royal connections and better facilities has become part of most boat tours of the island. It is only with the commencement of construction work on Koh Phangan Airport near Than Phraphad that the area has had any media exposure. Already some smart investors are beginning to see the potential for the region. It has the best beaches, pristine jungle, spectacular mountain scenery and, most importantly, Thong Nai Pan Noi with its 4 luxury hotels clearly indicates the viability of high-end tourism in the region. The dozen beaches on the east coast are all owned by local families. It is unusual for ownership to change hands: rather beach land is customarily leased out. Yet already rumor has it that Haad Yao East has been sold and Than Phraphad is up for sale. The success of Thong Nai Pan Noi has not gone unnoticed by the local communities along the east coast of Koh Phangan. Change will not come immediately. It takes 2 years to make an environmental impact assessment before building work can begin on a resort. Also Koh Phangan Airport is probably 3 to 5 years away from being fully operational. Investment in the region is a mid to long term strategy that requires plenty of financial clout and perseverance. Rasananda in TNP Noi was up and running in just over a year, as was Santhiya. The mooted developments require a different model. Time will tell, but anyone who has regularly visited Koh Phangan over the last 10 years will tell you how tourism and infrastructure on the island has changed dramatically. 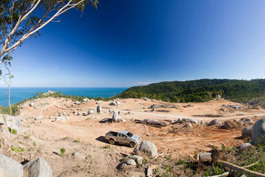 Lots of people were surprised to discover that Koh Phangan Airport was being built on the east coast of the island. It seems the least likely spot for an airport. There is flat land in the south near Ban Tai, and there are also areas along the west coast that seem more suitable for a runway. 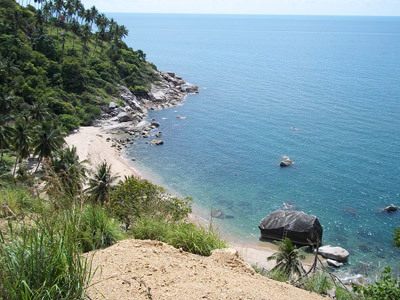 The east coast of Koh Phangan is the least accessible part of the island. There are still beaches such as Haad Nam Tok, Haad Thian and Haad Yuan East that you have to trek to or catch a boat to. The mountainous terrain and the jungle have left these beaches cut off from the rest of Koh Phangan. What then is the reasoning for attempting to construct an airport in the east of Koh Phangan? We can only guess the rationale behind Kan Air’s choice of site. Perhaps there wasn’t any other land available? More people are inclined to think it is to do with the luxury resort beach of Thong Nai Pan Noi in the north east of Koh Phangan. 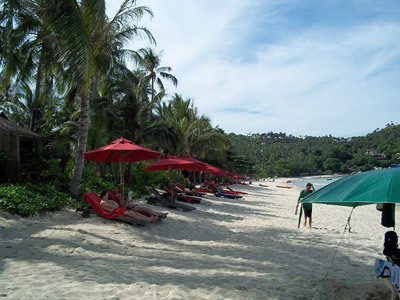 Thong Nai Pan is a magnificent double bay with towering mountains behind covered in thick jungle. In the 1980s it was a travellers’ secret – two perfect beaches very underdeveloped and very ‘chilled’. The secret got out and in the early 2000s there was a rush to build luxury accommodation on the smaller of the two beaches – Thong Nai Pan Noi. Now there are three 5 star hotels – Rasananda, Santhiya and Panviman. There is also one stylish 4 star resort called Buri Rasa. All the cheap beachfront bungalows have been pulled down. This year (2013) even the old Tapan Noi bungalows on the headland were pulled down. The village has even been altered with Buri Rasa setting up a European style paved café / shop enclave at the end of the village road where it leads down to the beach. The people who visit Thong Nai Pan Noi are the most likely to be willing to pay a premium to fly directly to Koh Phangan, and more so if the airport is just 10 minutes from their hotel. Moreover the site for Koh Phangan Airport is close to all the major parties on the island – the Full Moon Party, the Half Moon Party and the Jungle Experience. These seem the two most likely factors influencing the placing of Koh Phangan Airport. 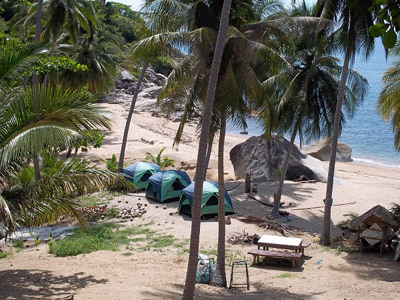 Haad Nam Tok is one of the smallest and least visited beaches in Koh Phangan. It’s on the East Coast south of Than Sadet beach. Very beautiful and also very hard to get to. From Haad Rin or Thong Sala, you need to take the Bantai Road until you get to the turning by the 7Eleven to go to Thong Nai Pan. Follow the Thong Nai Pan road about 500 metres past Koh Phangan Jungle Flight. On your right you will see a turning to Than Praphad and Kung Bungalows. It is a dirt track. Be warned this is a bad road. You can do it on an automatic motorbike if there is one person per bike and you are fairly confident at riding. The track is steep and rocky in spots. You need to follow the road and sign to ‘The Beach’ for about 4km; keep an eye on the road ahead because there comes a point you need to leave your bike – the road gets too steep and if you ride down you won’t get back up again. The best place to leave your bike is by the sign that says ‘Walkway to Beach’. Beyond that it is walking only. Once you have left your bike it’s only about a 20 minute walk down to the beach, but more strenuous back up. You need to bring water and wear a hat as you will get very hot. The views on the way are spectacular and the path crosses over the waterfall that gives the beach its name (‘Nam Tok’ means waterfall in Thai). It gets steep near the beach but there are ropes fixed to the rock to stop you slipping on the path. There is very little at the beach. A bar, which may or not be open. Sometimes some tents for rent and a toilet/shower block. Very often no one else is there. One local lives on the cliff above but bothers no one. Foreigners sometimes set up here for months on end doing the whole Alex Garland thing. Early 2013 there have been lots of beach parties here at night. If one is on when you go to Koh Phangan I would advise thinking about a visit. Very Old Skool and a small like-minded crowd. Just remember to bring water, beer, food and anything else you are going to need for a night out.